Italy’s 1.5 million Muslims have only three mosque. Forbidden by law from building more, they improvise, converting shops, gyms and discos into places of worship, culture and instruction. 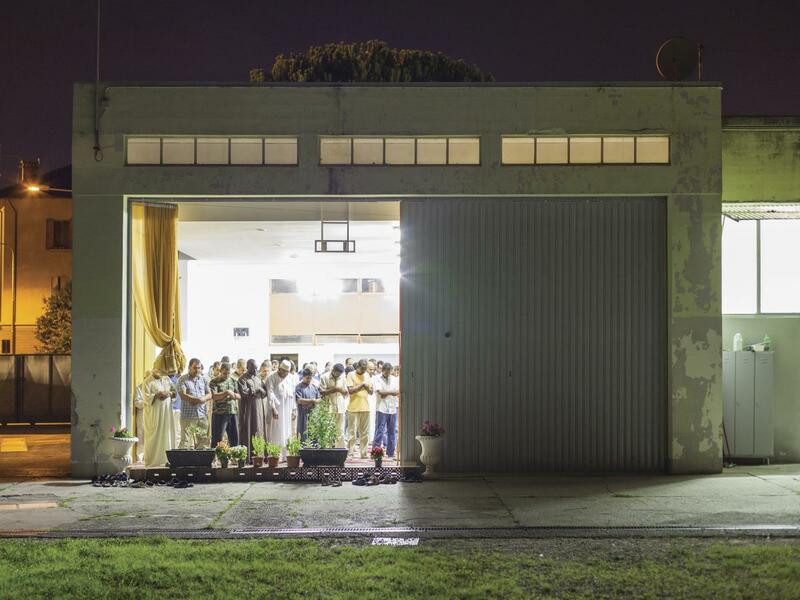 Cover photo: Final prayer at Ramadan at an industrial park near Treviso, Italy 2009. In only two decades, Islam has become Italy’s second-largest religion. Ten times as many Muslims live in the country now as compared to the 1990s, and their numbers are set to double again by 2030, boosted by immigration from North and Sub-Saharan Africa, the Balkans, South Asia and the Middle East. Italian Islam is growing fast, but officially, it does not exist. Due to a lack of will from successive governments and divisions within the religious community itself, Islam has never been formally recognised by the Italian state. As a consequence, Muslims may pray, but they may not build mosques. 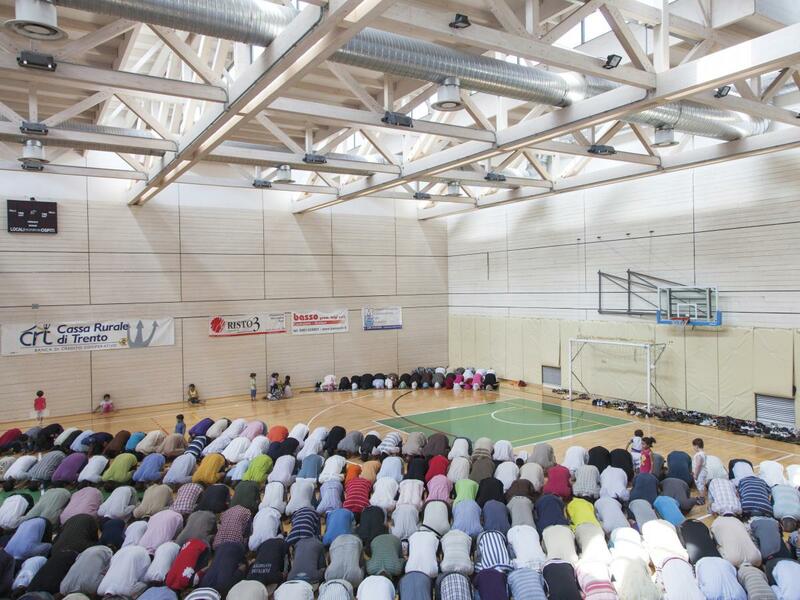 They worship instead at improvised ‘Islamic Cultural Centres’ in warehouses, shops, supermarkets, apartments, stadiums, gyms, garages and discos. 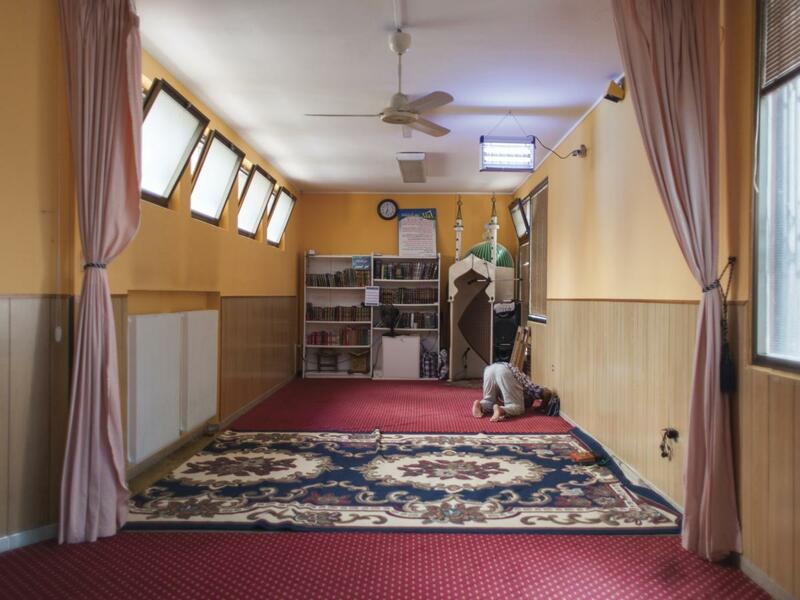 Italian photographer Nicolò Degiorgis documented them in a five-year project that resulted in Hidden Islam (2014), a book that maps these secret sanctuaries across his native north Italy. This mosque, a converted supermarket, was photographed in Trentino in 2010. The gate-like structure in the corner is a mihrab, indicating the direction toward Mecca. Usually the mihrab is a niche cut into a wall of the sanctuary, but this one is mobile. Since this picture was taken, the mihrab and the community have moved on. The site is now a gym. The enormous side door of this former facility for cleaning public buses in Udine has been opened for ventilation on a hot summer night during Ramadan, August, 2010. More than half of Italy’s Muslims live in the prosperous north of the country, where they fill an economic demand for migrant labour on farms and in factories. They also encounter the divisive politics of the far-right political party Lega Nord (Northern League). In Veneto’s 2010 regional elections, Lega Nord emerged with the largest share of the vote, a ringing endorsement of their anti-immigration platform, which they openly describe as fighting an ‘Islamic invasion’. This empty conflation of immigration and Islam (around half of Italy’s immigrants are Christian) has fed into an atmosphere of xenophobia and hostility so pronounced that Degiorgis chose to redact precise locations of the mosques in Hidden Islam. The degree of hostility faced by Muslims varies from place to place, depending on the local authorities. Some communities are given free rein to gather and worship, while others endure a police presence outside the door at every prayer meeting. Such persecution is especially acute in the area around Treviso, where in 2007 Lega Nord politician Giorgio Bettio endorsed the use of ‘the same methods against immigrants as the SS’ to ‘make them understand how to behave’. 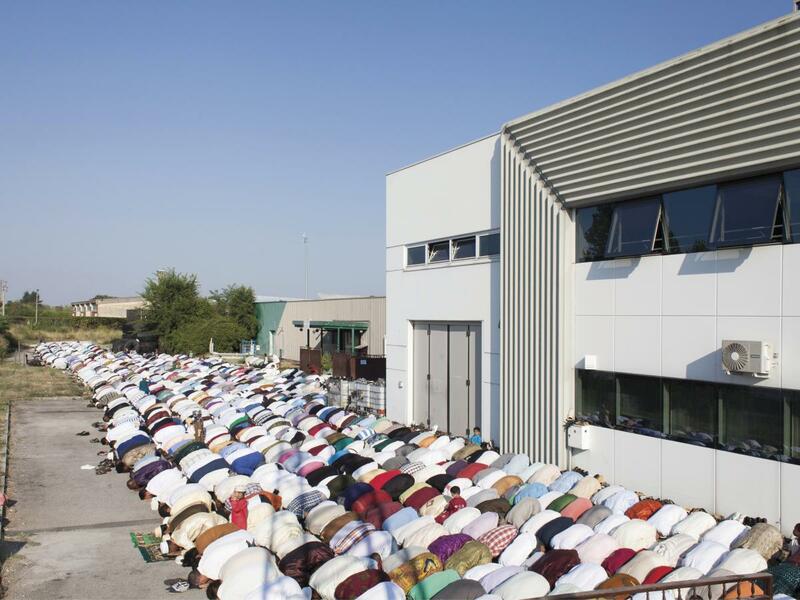 In Veneto, this image of hundreds of Muslims in a loading bay behind a major Treviso supermarket could either be an image of persecution or proof of Lega Nord’s ‘secret invasion’. The green and cream building in the background actually belongs to these worshippers, bought with donations from their wages at local clothing factories, but they are not allowed to pray in it. When they bought it, they had it registered as a cultural association. Treviso’s municipal government then declared it illegal to pray inside a cultural association. The community took their services outside, putting up a canopy to create shelter from the sun. Soon the police removed that too, exposing the congregation to the fierce summer heat. Despite this, in observance of Ramadan in August 2009, the men in this picture would keep coming daily during the month-long fast. They had drunk nothing since dawn and would wait until sunset before quenching their thirst. Because Italy’s improvised mosques are unmarked, many can only be identified by the number of cars parked outside on a Friday, and when Degiorgis arrived to photograph this mosque in November 2013, he had already set up and taken several exterior shots of another building before he realised he had the wrong nondescript warehouse in Spinea. Though their building looks the same as any other in its industrial neighbourhood, worshippers at the Centro Islamico di Spinea have taken literal steps to put their mosque on the map, paying for a position on Google Maps with accompanying images of the interior of the mosque. According to Degiorgis, their unusual action shows ‘that they have nothing to hide’. When Hidden Islam was published, Degiorgis showed the book to the communities he had photographed. ‘They had never thought of it this way,’ says Degiorgis. ‘I don’t think many of them realised they were hiding.’ It’s not that these centres are camouflaged because of the ban on mosques; rather, each is tailored to the neighbourhood it serves. Much like Christmas for Christians, the last day of Ramadan is the annual event that sees the largest turnout of Muslims. Some Italian Muslims will go to one of Italy’s only three mosques, including the one in Rome, (which is also the largest in Europe). The rest may find themselves in a sports centre. Rented by the hour, sports centres like this one, photographed in Trento in 2010, can handle the large crowds. Outside of Rome, neither of Italy’s other mosques is a fully operational religious institution. A Council for Italian Islam was set up in 2005, but coordination of the country’s disparate Islamic communities proved to be a task beyond its abilities. Italy’s Muslims may have to wait a generation before the next mosque is built. Nicoló Degiorgis ​is an Italian documentary photographer, teaching photography inside Bolzano prison and at the Free University of Bolzano. His ​​​primary motivation is observing how marginalised communities carve out a sustainable environment for themselves. Jonah Goodman is a British writer based in Berlin. A former editor of COLORS magazine, he looks for signs of shared humanity, wherever they can be found.